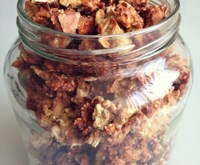 I want to let you in on something - most granola in stores is not healthy! I know this is one of those items that many people purchase thinking they are purchasing a healthy snack or topping for cereal or yogurt. Unfortunately many granolas are loaded with sugars. Not this one. Skip store bought and make your own with this great recipe. 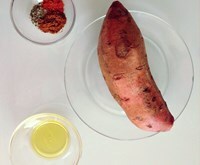 Sweet potato makes an excellent snack. They are a great source of complex carbohydrates, are high in fiber, provide a slow release of energy, and contain potassium, vitamin A and vitamin C. This is a great after workout snack to help replenish those depleted carbs. 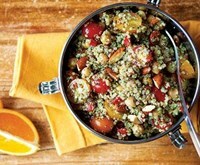 Quinoa is a very versatile grain. It's gluten free, for those with gluten sensitivity, and it contains protein - a complete protein at that! So this grain is also an excellent match for those who are vegetarian. It is a complex carbohydrate which means it won't spike your blood sugar and will help you feel fuller longer. I particularly like that anything goes in this recipe. Feel free to change up the ingredients to whatever suits you or what you have on hand.